Sheffield Postcard Co. :: Welcome to Sheffield Postcard Co. Welcome to Sheffield Postcard Co.
High quality nostalgic prints and souvenir products from our vast collection of Victorian and Edwardian old picture postcards. Refurbishment of pubs, hotels, restaurants and clubs. Company reception areas, offices and conference rooms. A fascinating focal point for any commercial or private property. We have many thousands of views from virtually every part of Sheffield and the main areas of South Yorkshire, sorted into postal district and then by street name. There are a large number of interesting and unusual views of sheffield city centre, and many outstanding views of suburbs, many of which were formerly villages in their own right. A superbly detailed selection of most towns and villages in North Derbyshire, with an especially good selection of the Hope Valley (including Castleton, Hope, Bamford and Hathersage). Also well represented are Bakewell, Matlock, Chesterfield and the Cordwell Valley together with most of the tourist attractions. Many interesting close-ups of horses and carts, horse drawn buses and trams, steam engines, early motorised buses and trams, fire engines and other municipal vehicles. A small but high quality collection of postcards depicting various industrial and agricultural activities, civil engineering and construction site workers and many other scenes of social historic interest. Other subjects available include deshabillé and drinks advertising cards. 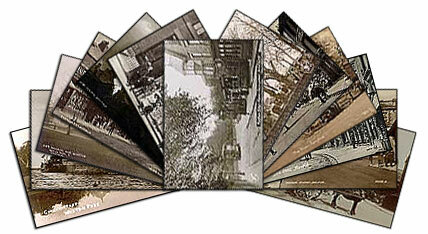 Postcards depicting other areas of the UK can usually be sourced & supplied to order. New images are continually being added to our collections.